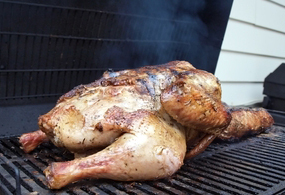 If have the good fortune of a temperate climate, or are intrepid and adventurous enough to brave the elements, grilling can be a much more than just a novel way to prepare your holiday bird. Grilling aficionados will tell you “Where there’s smoke, there’s flavor!” and grilling one of our organic free-range turkeys or all natural turkey breasts is no exception. You can use the rack to roast a butterflied turkey, flattened halves or a breast; and a kettle barbeque will allow you to use a roasting pan to cook a traditionally intact bird. Add the science of seasoned brines, and a myriad of marinades, spice rubs, and BBQ sauces to the mix, and you may never throw a bird in the oven again. These wonderful preparatory techniques enhance the succulence of your bird, with a spectrum of flavor bases that run from the sublime to the wow. Remember too, one huge bonus is that grilling will also free up precious oven space. There are a few considerations before grilling a big bird. For instance, it will take more than a humble pair of tongs to flip a butterflied turkey, and comparatively speaking summer steaks, plump chicken, and sausages all grill relatively quickly. Even a small turkey calls for a substantially longer cooking time than that fare. This level of charcoal grilling also requires a certain degree of finesse with regard to controlling cooking temperatures. Depending on your recipe, you will need to add charcoals during the cooking process to maintain a steady 325°F to 350°F temperature. Having said that, even if you are an enthusiastic novice with your sights set on your first grilling adventure, don’t let us dampen that pioneering spirit; especially if we are talking your Thanksgiving bird, after all that’s how that party got started in the first place! We have several helpful articles that will get you well on your way, and the big flavor pay off will be well worth the effort. Previous Post Super Easy Thanksgiving Canapés!